⚓ T352 Software reports that Blender fails to install, but is in fact installed. Software reports that Blender fails to install, but is in fact installed. 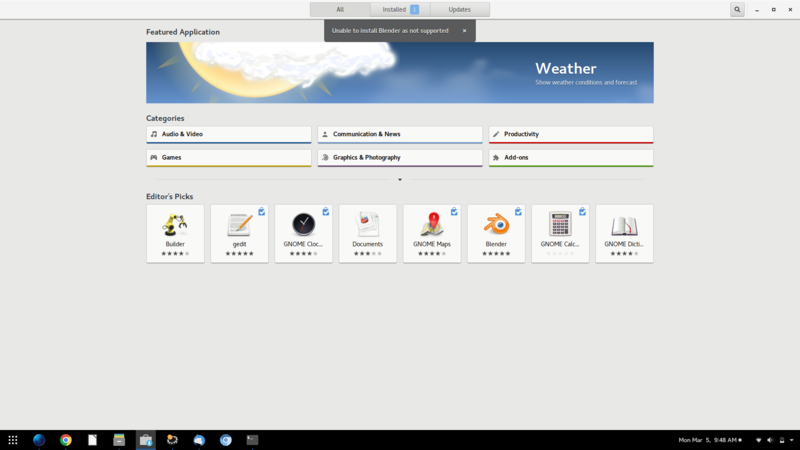 PureOS up to date. Librem 15v3. As you can see from the screenshot, Blender is installed but Software is reporting the opposite. Intended behavior is that Blender would install normally and launch. It does in fact launch from Software or the menu. Uninstall of Blender keeps the notification "unable to install Blender as not supported" or "something went wrong." Additionally, the update of (1) listed under the installed section continually remains regardless of Blender being installed or not. Reproduce steps: update PureOS, install Blender. zlatan.todoric added a subscriber: zlatan.todoric. That's a weird one... Can you still reproduce the issue? Can you verify that the "packagekit" package is installed? The issue remains. I'm informed of this "unable to install" issue everytime I open Software. I'm still seeing these despite the numerous updates/reboots that have happened since along with uninstalling and reinstalling Blender. 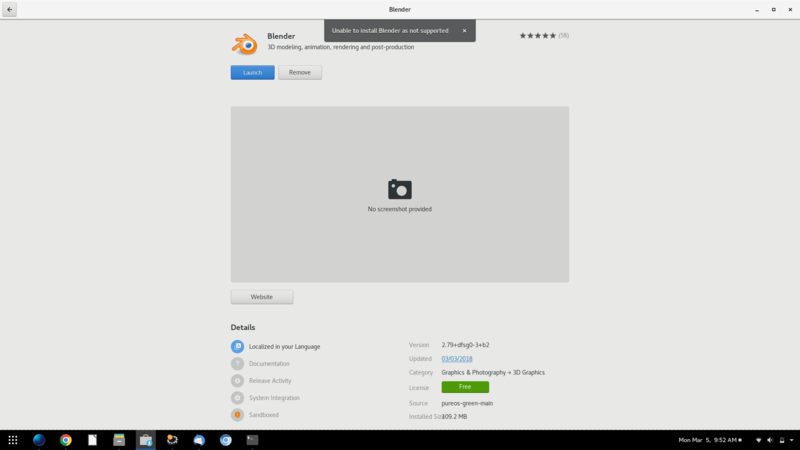 Can you please run gnome-software in verbose mode (killall gnome-software ; gnome-software --verbose) and see what GS says when you load the Blender page?